Apple’s tablet, which may be on sale as soon as November, will be the best computer you ever bought. It will be better even than the beloved iPhone. It will be an entirely new kind of computer that will usher in a new kind of computing. It will be a horizontal iMac: a touch-screen computer that you use horizontally, in your lap or lying on the couch. It will be a complete rethink of the computer for play, not work, and it use the original pointing device — your finger. It will be really easy to use — a pleasure in fact, because it will be magical. The tablet is Apple’s answer to the exploding netbook market, but it won’t be a piece-of-junk netbook. The last thing Apple will do is glom a touchscreen onto a low-cost laptop. It won’t even put a touchscreen on a regular desktop like an iMac. It makes little sense to touch an iMac’s screen when it is sitting upright. But drop the iMac into your lap, and touching objects on the screen makes perfect sense, and seems perfectly natural. Instead, Apple will address what people DO with their netbooks — surf the Web, watch movies, video chat. It will be capable of some light productivity work, like instant messaging, email or writing blog posts. It’ll be lightweight, easily portable, and have long battery life. No Keyboard, Mouse or Stylus: It will not have a keyboard or a mouse or other input hardware except a touchscreen and microphone. It’s not designed for work; it’s for lifestyle computing — internet communication, personal creativity and entertainment. It will be perfectly adept at editing and uploading pictures to Flickr or editing movies for YouTube. Not Niche: It will not be a niche product like previous tablets. There is a huge market for an easy-to-use HOME tablet for games, creativity and communication; because this is what a huge market of mainstream home consumers use their computers for. No iPhone OS: It won’t be a super-sized iPod or iPhone. Its primary OS will not be the iPhone/iPod Touch OS. Apps for the iPhone/Touch are built for a fixed-sized screen, and the tablet will be much bigger (and have a different processor). It makes no sense to put pocket-sized apps with pocket-sized controls onto a bigger device, especially one that won’t fit into your pocket. It may run the iPhone/Touch OS in emulation though. This would give iPhone developers easy access to the tablet, and users easy access to the vast library of apps on the App Store. Games: The most important class of apps on the App Store for the tablet will be games. With its big HD screen, accelerometer controls and touchscreen interface, the tablet will be a unique — and fun — gaming platform. The Clues are Everywhere: The evidence that Apple is working on such a device is in plain view. Apple has already made its iLife apps touch friendly, and with the next version of OS X, Snow Leopard, the process will be complete. Snow Leopard’s Diet: Snow Leopard will be half the size of Leopard — about 3GB instead of 6GB. It will be optimized for multicore processors. Apple is streamlining its operating system to run on a wide range of devices — from desktops to laptops and lower-powered mobile devices like touchpads. One OS to rule them all. Snow Leopard Is a Touchscreen OS: As Apple demonstrated at the WWDC programmers conference earlier this year, Snow Leopard will have a slew of “finger-friendly” features, such as Cover Flow throughout, Expose, Stacks and Quick Look. (First noted by CNet). Cover Flow: Apple has added Cover Flow (a graphical 3D interface for flipping through thumbnails of files, photos or album covers) to many of its apps and much of the operating system. If selected, Cover Flow can act as the primary interface for browsing folders in the Finder, or your surfing history in Safari. Safari 4: The latest version of Safari already uses Cover Flow to browse history, bookmarks, RSS feeds, even your Address Book. Browsing your History with a graphical representation of the pages you’ve visited doesn’t make that much sense, except on a multitouch screen. Cover Flow for browsing your website History folder doesn't make a lot of sense, except on a touchscreen device. 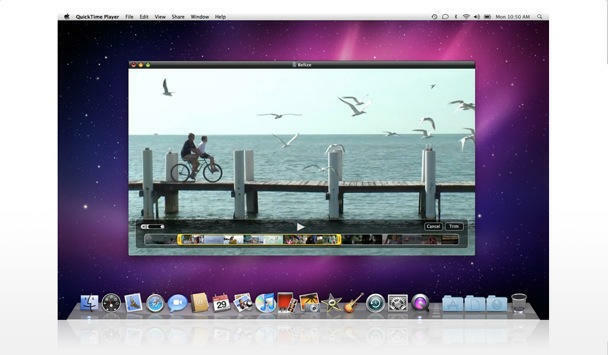 QuickTime X: In Snow Leopard, Apple’s long-running multimedia system, QuickTime X, has been simplified and rationalized. It looks and operates like the multimedia controls on the iPhone. Look for example at video editing in QuickTime X. You can trim video by dragging a pair of yellow handles to mark the clip to be edited. It’s just like the editing system that debuted in the iPhone 3 OS, which was designed for fingers. 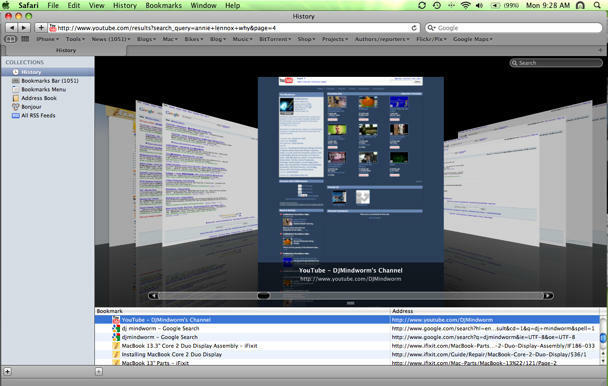 QuickTime X in Snow Leopard is a good example of how Apple is making its apps finger-friendly. Inspired by the iPhone, the controls are much simplified and easier to manipulate directly on the screen. Editing video in QuickTime X is now like editing video on the iPhone, with a UI designed for fingers. Formerly involved tasks like exporting to video to an iPod are now one-click affairs, easily achieved with a jab of the finger. Expose in the Dock: Expose is a feature of the OS that shows all the open windows at once, or just windows from a particular application. In Snow Leopard, you’ll be able to click on an app’s icon in the dock to see all the app’s open windows. It seems custom designed for touching and holding an app with your finger to easily select the window you want. Stacks: Another Finder feature in Snow Leopard that seems designed for you fingers is Stacks, which pops up thumbnail previews of the files in a folder. Previously, the number of files was limited. In Snow Leopard, it’ll show all the files in a folder, and if there’s a lot, you can scroll up and down with a finger-friendly scroll bar. Quick Look: Quick Look in Snow Leopard is another Finder feature that seems custom designed for multitouch. Hold your finger down on a file to see a popup preview of the file’s contents. Works fine now with a mouse, but will work great with your finger. Microsoft and Windows 7: If this all sounds unlikely, consider that Microsoft is doing much the same with Windows 7, which will be out in October. Unlike Apple, which is very secretive about its product plans, Microsoft talks quite openly about making Windows 7 multitouch friendly. Windows 7 will have many similar interface tweaks for multitouch, and Microsoft will be rolling out its own multitouch computers with the Surface table. PC maker Asus and others already have touchscreen computers on the market, based on Windows XP. While Asus’s Eee Top PC is clunky, it is quite useable in a kitchen setting where you are watching videos rather than making spreadsheets. Multitouch Already in iLife: Apple has already added multitouch controls to much of iLife. This is no big surprise — all the new MacBooks have trackpads that support multitouch controls (and so will older MacBooks when Snow Leopard ships). But these apps could be easily controlled with your fingers. Look at iPhoto — it’s easy to see how it would behave exactly the same with your fingers as your mouse. The iPhoto app already supports multitouch controls — scrolling through photos with three fingers; pinching, zooming and rotating. But instead of executing them on a touchpad — which is somewhat removed from the photos on the screen — you’ll be able to manipulate the pictures directly. The Limited UI in iMovie 08: When iMovie 08 was released, the application took a lot of criticism for its limited feature set compared to the previous version. But look at it as a finger-friendly app, and the changes make a lot more sense. It’s easy to see how you could scroll through movie clips with your fingers, dragging them to the project area, and marking edits with the iPhone-like position sliders. Formerly complex operations like adding titles, transitions and special effects are now executed by hitting big, finger-friendly buttons. Hidden Multitouch Features in iLife: There is more multitouch functionality in iLife that hasn’t been turned on yet. For example, you can enable moving and zooming photo-location maps in iPhoto with some Terminal magic. Design: The tablet will be made of aluminum and glass. The battery will be sealed, and there will be no optical drives. You won’t be able to play DVDs, but it will have an SD slot for camera memory cards or emergency boot disks. It may not even have a hard drive — Solid State Drive only. Wireless Connectivity: WiFi and Bluetooth on all models; 3G wireless as an option for “mobile” models. Camera: iSight camera on the front for Photo Booth and iChat videoconferencing. Stand: It’ll have a dock stand for recharging and syncing to devices like the Time Machine backup box via Ethernet. The dock will also hold the screen upright like a conventional screen for work. Just pair it with a Bluetooth keyboard and mouse. Cloud Apps: With seamless WiFi and 3G connectivity, the tablet will be a perfect device for cloud apps. The cloud, after all, fits Steve Jobs’s vision for the future of software, and Apple’s building a big East Coast data center. Virtual Keyboard: If the tablet has a bigger screen, say 10-inches or more, you’ll lay all 8 fingers on the screen and up will pop up a virtual keyboard. Cocktail: Apple’s rumored Cocktail project, a rethinking of the album for interactive digital media, will be just one of many new killer apps that will make use of a nice big screen, a beefier processor, always-on Internet, and naturalistic gesture controls. Imagine a Kindle-killing eBook app that allows you to flip through the virtual pages of a magazine with your fingers. Maybe it will switch automatically to a low-power black-and-white reading mode when the tablet is held in portrait mode. Apps like the Classics Collection eBook reader for the iPhone, which allows users to flip through the pages of an eBook, hint at these kind of capabilities. It will change the interaction model for PCs from menus and buttons, links and mouse clicks, to manipulating objects directly on screen with your fingers. Alan Kay’s Dynabook: It 1968 the computer genius Alan Kay envisioned the Dynabook — a “dynamic book” for digital media. Kay called it a “computer for kids of all ages” and imagined a slate computer, or tablet. Kay’s ideas inspired the first graphical interfaces at Xerox PARC (which in turn inspired Jobs and the Mac). Even in 1968, the natural form factor for a computer was a tablet with a graphical user interface. Apple’s MO: In November 2007, Steve Jobs admitted that Apple is researching multitouch for computers. “Consider it a research project,” Jobs said about a touchscreen iMac. The tablet has Apple’s modus operandi all over it. Just as the iPhone wasn’t the first smartphone, the tablet won’t be the first tablet. But it will be the first tablet that makes sense for the mass market. What Apple is doing is rethinking the computer for the home. Netbooks, laptops and desktops are machines that were designed for work. Made to sit on desks, they are computers from the productivity era, designed for offices. With the tablet, Apple will define a new category of home computers that are made for play, not work. The tasks that home users want to perform are already pretty well defined — videoconferencing, watching movies, listening to music. Apple is making a computer that makes those tasks easy, natural and well, magical.